Safe Laboratories Ashbrook Peter C.
Add to cart the livre of Ashbrook Peter C.
This book provides an introduction to basic concepts in the design of safe laboratories. Many of the chapters in this volume are based on papers presented in a symposium sponsored by the American Chemical Society's Committee on Chemical Safety and the Division of Chemical Health and Safety. 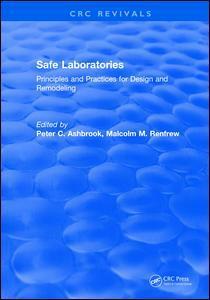 Topics covered within the book include different perspectives on the design of safe laboratories, generic issues affecting the design of safe laboratories, ventilation and fume hoods, putting laboratory design and safety principles into practice, and working together to design safe laboratories. This publication is intended for individuals and businesses interested in incorporating safety design into laboratory construction and remodeling projects. 1. Different Perspectives on Design of Safe Laboratories: Overview of Objectives in Design of Safe Laboratories 2. Safe Laboratory Design: A User's Contribution. Designing Safe Laboratories: An Architect's Perspective 3. Safe Laboratory Design: A Safety Professional's Perspective 4. Generic Issues Affecting Design of Safe Laboratories: An Overview of Basic Life Safety Principles 5. Basic Principles of Ventilation in Chemistry Laboratories 6. Basic Components of Laboratory Plumbing Systems 7. Do's and Don'ts in Providing for Storage of Chemical Wastes in the Laboratory 8. Ventilation and Fume Hoods: Working Together to Design Safe Laboratories: Ventilation, A Consultant's Perspective 9. Basic Principles of Fume Hood Design and Operation 10. Common Ventilation and Fume Hood Problems 11. Basic Concepts for Improving Ventilation During Major Remodeling Projects 12. Putting Principles into Practice: Safe Laboratory Design in the Small Business 13. Safety Considerations in the Renovation of High School Science Laboratories 14. The Los Angeles Unified School District - A Study in the Evolution of Facilities for Teaching High School Chemistry 15. Design of Safe R & D Labs 16. Safe Handling of Hazardous Chemicals in a Chemical Containment Laboratory - Design Requirements of a Chemical Containment Laboratory 17. Working Together to Design Safe Laboratories: Where Laboratory Design Projects Go Right or Wrong.